The 2010 hurricane season began on June 1, amid widespread concern over the potential for a large storm to exacerbate the damage from the Deepwater Horizon oil spill. 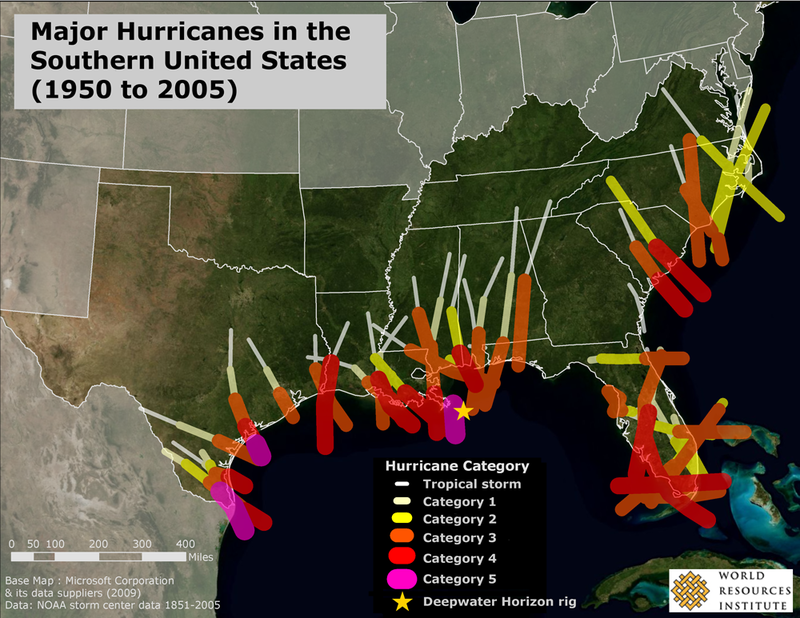 As the map above shows, catastrophic hurricanes (Category 3 or higher) regularly hit the southern coast of the United States. NOAA (the National Oceanic and Atmospheric Administration) predicts an 85 percent chance of an "above normal" hurricane season this year, due to conditions including exceptionally warm sea surface temperatures in the Atlantic Ocean tropical zone. According to NOAA, a hurricane could spread the oil over a far wider area or potentially carry oil inland via storm surges. Because hurricanes rotate counter-clockwise, a storm passing to the west of the oil spill could bring oil closer to shore, while a storm passing to the east could push the oil further out to sea. This work is licensed under the Creative Commons Attribution License https://creativecommons.org/licenses/by/3.0 . Cite "World Resources Institute." This map is part of a continuing project to produce maps that shed light on significant environmental issues throughout the world.